There was something quite magical about watching enthused audiences scribbling notes to a woman who had been a complete stranger to them less than two hours ago. These ‘dear Jini’ letters were written following screenings of Her Aim Is True at Tallgrass ‘stubbornly independent’ film festival and Hot Springs documentary film festival last month. With Thanksgiving upon us, I have been thinking more and more about how Jini’s unknown and unlikely role pioneering rock photography has impacted complete strangers, 1000s of miles away and decades apart from when “rock” met Jini. So, I am sharing a few of these ‘letters’ below, and across our social media, as the production’s act of thanks to Jini for her artistry, to the community that has supported this film throughout production, to the film festivals who helped us share Jini’s story in recent months, and in the hope that you will, too, feel inspired to help us reach many more audiences with a true visionary and pioneer you have never heard of before. Your timeless beauty, grace & style has touched me deeply. Your life inspired me beyond my greatest expectations. The biggest take away from the film is that there are no boundaries: if you open your heart and follow your passion. Live, love and say yes! You are an incredible inspiration to MANY! Thank you for sharing your story. I love how you captured the connection and beauty between art and music. Your love of people is contagious! Your lens shows me the deepest parts of your subjects and you make me want to know more about you and the musicians you love. Your life long love of photography and youthful soul inspire me to always keep true to what I love. I will share your story with others and never forget this connection. The film brought many emotions: sadness that I didn’t know this wonderful story, that many didn’t and still don’t know. Joy – what a pioneer, a quiet inspiration. Excitement – to add another female leader, artist, story to my list of those who give me hope, help me dream. I don’t know when audiences will have another chance to write letters to Jini and experience her artistry. Finding a place in the spotlight for an indie arts film about an unheralded and almost 97 year-old artist requires plenty of creative thinking, determination and collaboration. So this is also my act of letter writing to you; I am seeking community partners to support the film’s launch into the world beyond film festivals, and as such, I encourage you to pass on this message to anyone who might be perfectly placed to work alongside the production and ‘sponsor’ community screenings. 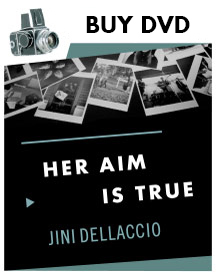 Because, Jini Dellaccio’s photography matters. #artmatters. And being thankful for Jini Dellaccio’s life in art, involves making sure the film reaches audiences and programs where we can inspire creative and critical thinking for life.